This book actually took me a very long time to read. When it first came out I started to read it but it upset me so much that I had to stop. I picked it up again years later and it still took a long time to read. Not because it wasn't well written, but because I found it difficult reading about the horrific abuse these children suffered at the hands of a vicious and evil man. This is one of the most upsetting and heart-breaking books about child abuse I've read. I think the fact that I knew the son of one of the twins brought it even closer to home. This all took place in the 1960's in an area in Manitoba, near where I spent most of my childhood summers years later. This book is based on the true story of twin boys David and Dennis Pischke and the horrific abuse they (and their siblings) suffered at the hands of their step-father, Boleslaw (Bob) Domko. David and Dennis Pischke recall happy memories with their father, Bill. However, after their father passes away, Boleslaw Domko shows up in their home town of Moosehorn, Manitoba. Domko comes to work as a hired hand on the farm, but quickly becomes involved with the children's mother and soon they have a child together. Once Domko moved to the farm, all of the children's lives became a living hell. Beatings, starvation, and severe neglect. One of their earliest memories the children have is of Domko throwing their baby sister, Kathy at the wall when she wouldn't stop crying. Thankfully she survived. While some neighbors were incredibly helpful to the children there were many in the community the turned a blind eye to what was happening. The boys vowed that one day they would expose Domko for all of the horrible things he did to them. They said they would also expose the religious organization and others who turned a blind eye to what was happening to them. At the time the book came out there was a lot of local publicity. There is a 16 minute documentary with the twins posted on YouTube:https://www.youtube.com/watch?v=mW2_f...I have so much respect for these children who survived their brutal childhood and decided to speak out, share their story in order to bring more attention to such an important issue. They show how tough the human spirit really can be. In May of 2000 David Pischke walked from Banff, Alberta to Steep Rock, Manitoba and spoke out about child abuse at many conferences. The subject matter is difficult to read about, and much of the content will make readers very uncomfortable. However, their story brought much-needed attention to the pain and struggle that unfortunately is still a reality for many children today. There is another book written about their story "When Memories Remain" and I hope to read that one as well. This may be the most depressing and frustrating book I've read all year and that's saying something considering my selections as of late. Seriously, If you're going to read this, I suggest you only read a chapter at a time. Too much and the water below the local bridge will start looking pretty enticing. Don't believe me, read this well-written review. Now, if you don't mind, I'm going to go snuggle with my kid and send the grown ones my love. This book is heart-wrenching and sad. A true story, about two twin boys who have lived their childhood in wrath under the care of their physically abusive step father, and unfit mother. Their story within the lines, scream out all the strength they had to keep going to survive another day.Highly recommended to all who have a soft spot for child abuse cases, and all that are interested in the depth a person will go for survival and the love of a sibling. This book also has a sequel called "When Memories Remain" - Karen Emilson. This is based on a true story. My Dad actually met one of the boys (now an adult, of course) whose story is told in the book. The book itself is not well-written in a literary sense, but the story is gut-wrenchingly sad. We are proud to announce that WHERE CHILDREN RUN by Karen Emilson is a B.R.A.G.Medallion Honoree. This tells a reader that this book is well worth their time and money! Child abuseThis is one of the worst cases of child abuse I have ever heard of. How these children ever survived this is nothing short of miraculous.I can't understand there mother putting them through this.Fear is no reason because she could have left also.May God bless these children who are now adults. The will to survive against the devil himself! This is a powerful, troublesome, & emotionally draining read especially for abuse survivors like myself and so I feel a personal and deeply rooted connection. There's a cluster personality connection with malignant narcissist in DSM Manual & diagnosed paranoid schizophrenic like Domko so for me it's very relatable.A true story of survival for an entire family but specifically David and Dennis Pischke the main targets of Domko (stepfather) from every form of abuse ( psychological, physical, verbal, emotional, religious, financial, sexual). Nothing was off limits and sadly that included the 11 children of Caroline Domko- who she herself had a difficult childhood and was known to be sexually promiscous. Deeply poor, lacking the basics, forced to perform manual labor as children, starvation, isolation, was sadly the norm. These children for all intense purposes were silenced. Hoping for change but constantly receiving empty promises and a trail of destruction with invisible scars that will always remain. Odd behaviors, animal abuse, killings for fun, disturbing actions were simply to be expected.The first publication in 1996 is being retold in 2017 and I'm so lucky to have been provided this copy for an honest review. I was truly taken back by this story and totally distraught realizing as a nation we have changed very little regarding the assistance of helping victims of abuse. Victims must prove abuse while perpetrators rarely see justice served.We see here the perfect cycle of violence storm. The abuse occurs behind closed doors, the perpetrators ( Domko and Caroline) hide it the best they can or deny its occurrence, the police or social worker arrives and leaves, nothing is done. Worse still if the family decides to exit the situation they are pulled back in through shame , guilt, or blame. The abusers even hide behind religious beliefs as Jehovah's Witnesses to excuse their behaviors.The perpetrators are too self absorbed to fully deal with the proper raising of the children. These children literally must "run away from abuse" and the lengths to which they must travel is beyond description. Even if the truth was made public who would believe them? After all they were kids and the mom had her own issues even partaking in the beatings and leaving the kids with the man accused of abusing them.The laws also make it difficult as children are not scene as credible witnesses.So many reasons why abuse survivors don't speak out is for this exact reason. In domestic violence cases the abuser promises to change, shows remorse, love bombs the target and then the cycle continues because it's about power and control. Victims lack resources to get out as scene in this case. Where does one go without the proper resources and support?Women were raised back then to believe they couldn't go on without a man. Caroline's father was thrilled when she married. Those closest to the family believed the "lies" thinking that the children just needed to be disciplined for acting out while the wife needed to be more engaging to her husband and her duties as a mother. The marriage in fact was warranted only for the fact that Domko wanted Canadian Citizenship since he originated from Poland.The abuse was so severe that one of the children (Kathy) went blind from being tossed against a wall. Kids almost entered a foster home because of the abuse. Eventually Domko was arrested but it was too late.Why must someone get brutally beaten nearing death before we as a nation do something? Those in charge of protecting the family(courts, polices, social workers) never want to break up a family yet that's what sadly must happen for survival.Who could possibly understand the extent of their abuse? Well I for one do believe because I lived the same hell but not nearly as severe. Unless you lived it you couldn't possibly understand it.The epilogue was very helpful. Very well written and well documented with plenty of pictures showcasing the past to give readers a sense of the situation at that time with pinpoint accurate detailing of first hand accounts. Truly a must read! 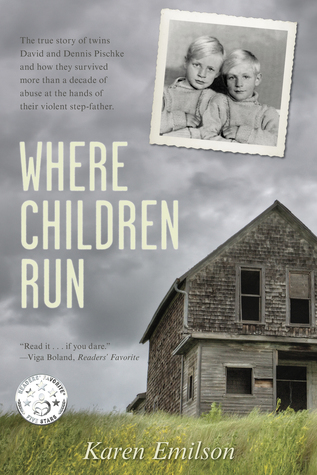 Where the children runThis was a thought-provoking memoir of a sad childhood of poverty made exponentially worse by severe abuse. I felt physically ill at several points in this book especially with the detailed descriptions of the animal cruelty. Unfortunately for these children many turned a blind eye and even their own mother chose to accept the abuse rather than do whatever necessary to escape. Personally I cannot comprehend that choice but it was a different world for women back then. I am relieved that the twins were able to finally be free and live the normal lives they always deserved. What a StoryI have heard of The Pischke Twins before but I had NO idea what there story was until I read this book. There are no words to describe what this family suffered at the hands of a physopath. It is indeed a complete Miracle they survived. I could not stop reading this book until I finished. The twins story has affected me like no other book I have ever read. This book will stay with me long after the last page read. Very disturbing book - I certainly did not read it before going to bed at night as the description of abuse made it easy to envision what the children endured for so long. It was, however, very difficult to put down. I certainly appreciate the details at the end in relation to how the lives of the main participants in the boys lives unfolded. I hope people read this and try to help others who may be suffering similar fates to what these kids experienced. Excellent !I flew through reading this book as if I were watching a movie. The sheer strength of David and Dennis had inspired me. As for "Satan" after all he did he couldn't suffer enough in my eyes, but he got his in the end. My thanks to author for telling this story in hopes that others can gleen from this the truths of children of abuse in a system with blinders on. Heartbreaking and so worth readingThis novel grabbed me from the beginning of was so sad especially when you realize it is a true stories!! I could not put this down it is that good!! I was a cheerleader for the twins and have never wished someone harm as much as I did the stepfather in this book!!! Heart wrenching There are no words to describe the horror those kids went through. I had to stop reading so many times because it was just too much to handle, It’s so appalling. But, that they were able to rise above and speak out is an amazing testament to their strength. The story of what these kids went through is unimaginably horrible. What I didn't like was that there was no resolution at the end. I guess since it's based on a true story you can't change the ending, but after going through all that abuse I wanted some kind of retribution or action. Excellent What a book. Its heart breaking and makes you think. Makes you want to help. Good read. If you see something do something don't say it's not my business because it is your business. Very moving story about a family I knew personally. The author does great justice to the retelling of this heartbreaking, and at times harrowing, tale. Please be advised there are many triggers throughout this story for anyone who has experienced trauma or abuse. Wonderful book! So well written!Although, at times, I found this book difficult to read because of the pain this family endured,I also found it impossible to put down! Great, but emotional read! HeartwrenchingThe story told is full of raw emotion and unbelievable heartache. The only satisfaction is knowing that David and Dennis were able to tell their story, be heard and be believed. Book starts out great, but after awhile there is a lot of running into the woods over and over again and more beatings...seems to be repetitive. Unbelievable story!Excellent book. Painful to read at times but couldn't put it down. Don't miss reading this one. Child abuse at the highest level. Great storyThose children never got a break! A very good read.. Sometimes a little graphic when the killings of animals were told. I really can't stand that Domco or Caroline! I read this book in one sitting.. I simply couldn't put it down.. How children like this survive is a miracle. Good bookI can't say I enjoyed this but I have no trouble believing it! So glad these children lived and built good lives. A testament to fortitude Amazing story of the strength of our human survival instinct. Good to reflect on when we think our lives are tough. Where do you go when there is nowhere left to hide and you have no one to stick up for you? If you are the German-Canadian Pischke twins or their siblings in 1950s Manitoba, then you find yourself chased out of your own home into the frigid winter night with your prejudice and psychotic Polish stepfather close on your heels. Why does he hate you? Easy, because your deceased father was German, you speak German, and despite having a Polish mother are deserving of nothing except cruelty and hardship. Even your own Polish maternal grandfather despises you and encourages this "fine upstanding" Polish man to be as cruel and harsh as possible. With a man crazed mother, who had the audacity to suggest her older children change their surname and learn to speak Polish, the only solace for the Pischke children came from kind neighbors who often gave them food and took them in for the night. When brave enough to stay at their mother's rural homestead the children spent their days slaving like Hebrews to maintain the farm while being starved and ever watchful for the next random beating, barely attending school. In a country as progressive and committed to the welfare of children as Canada, I was stunned that over and over again people, even those mandated to investigate, repeatedly saw the beaten and emaciated bodies of these profoundly abused and neglected children, yet left them to suffer. It was unbelievable how easily people accepted claims that the children were unruly and troublemakers, while knowing very well they were barely fed at home and could hardly ever sleep in their own home. They were only freed when they one by one ran away and never returned to their mother's homestead, with hardly any education or resources, except their own desires to escape the fear and loneliness that comes from living under a deranged monster's reign of terror. Here you have a harrowing story, told in 3rd person, of survival against all odds. I don’t think there is anything sadder than the story of abused children. That’s saying a lot because there are so many sad stories in this world. When people can live through abuse and turn that misery into something that helps and inspires others it is a powerful thing. That is what Where Children Run is. A powerful testament to the human spirit. I liked THIS BOOK. It is very beautifully written and it really rang true. It is a Canadian story but I imagine this kind of home horror has occurred in America and every other country in the world so many times that it would make you weep to think about it too much.The setting is a part of Canada I have never visited so I can’t really vouch for whether or not Karen Emilson got it right but it certainly sounds like it. The dialogue is peppered with dialect and speech patterns that are easy enough to read and follow. I’m guessing they are dead on. Where Children Run is character and family driven. We see David, Lynne, Dennis, and all the others very clearly and if you are like me, they will remind you of people you know. In a way it is the history of a family and as such there is no contrived and convoluted plot, just sad old real life. Trust me, it is exciting enough. We get to fall in love with these characters and there is even an epilogue letting us know how things turn out for most of them. I think this story had to be told. Lucky for us, it was told well. Such a heartbreaking story. I wanted to take in those kids so bad myself. I would have liked to have heard more about the other children during the time but I know the focus was on the twins. When the children lost feeling for each others pain that was even more upsetting. I understand it but still.The animal abuse, I could barely stomach those aspects. I was just sickened by it. The poor children and creatures. Innocent and undeserving.I really enjoyed one part of the book and I laughed quite a bit over it. All I will say is "He grabbed my potatoes." I wished there had been more positive things like that in the book but I am guessing there wasn't any in those poor children's lives. So heart-wrenching and sad. The short documentary on the authors page is a must watch.I am very saddened to hear that David has since passed due to a heart attack. To those who do not believe these boys should be ashamed of themselves. If you are questioning the truth watching the documentary I cannot see how you could not believe. Those who turn a blind eye are almost as guilty as the abuser. The true message here is to help those in danger now. If you know of child abuse do not sit back. There are many ways to anonymously let the right people know what is happening. Please help put an end to child abuse. Definitely worth a read. It's sad, touching, but not so graphic or disturbing that it's hard to get through. It's a true story, which will both infuriate you that nothing was done, and inspire admiration for the resilience of these children. Child abuse was not taken that seriously in the 60s, especially in rural areas, of any country. We can be thankful that we are improving more and more as a society in protecting our children.The book is worth reading, but because this hasn't been taken up by a big publisher, there are some grammatical/spelling/formatting issues that remain. It's not everywhere though, just points here and there throughout the book, and it's easy enough to look past them in this case. The book maybe goes on a bit long as well, but again I chalk this up to not having the opportunity to be proof-read by a publishing company. All in all, a good book, a sad but interesting story. Karen Emilson - Karen Emilson was born and raised in southern Ontario, the daughter of Irish immigrants on her mother’s side; and an eclectic mix of Swiss, German and English on her father’s side. She spent all her free time as a child reading books and writing stories, dreaming one day of becoming a writer.In 1982 she came to Manitoba as a young bride, settling in at the Nordheim farm in Siglunes. Karen spent little time in the hayfield or on the lake, but instead worked as a rural newspaper reporter and wrote stories, publishing the Canadian Bestseller, Where Children Run in 1996 and its sequel When Memories Remain in 2001. For years she worked for the Manitoba Beef Producers Association, typeset the Icelandic Connection Magazine, and spent time as a consultant with Logberg-Heimskringla.When Lake Manitoba overflowed its banks in 2011, flooding out the farmland at Siglunes, she was inspired to finish a story started 10 years earlier about the immigrants who carved out a living there. She can’t sing, dance, draw or play an instrument but lives in awe of those who do. Now she lives in Grunthal, Manitoba and writes full time. Be Still the Water is her first novel.